The Largest Unbiased and Independent Checker Program Review Site on the Internet! Please note that all programs reviewed are tested on the Windows XP operating system unless explicitly stated otherwise (there are a couple of old MS-DOS programs and a couple of Linux programs). I do not have a Mac and so I cannot test Mac programs; independent guest reviews are welcomed. Purveyors of checker programs, please read this before sending me email about your latest creation! I will not advertise your program on my web site, link to your site, etc. This is an independent and unbiased review site! If it isn't 8x8 American/English checkers, I don't cover it, so don't tell me about your four-dimensional trapezoidal piece checker variant. If your program is a Class D or F entrant, thanks, but no thanks. As stated below, I no longer spend time reviewing bad programs. Here are reviews, commentary, and ratings for a large and growing number of checker playing computer programs. Quick advice on using the ratings: if you want the best, go with a Class A program. You might go to Class B to select entries smaller in size or with special visual appeal. You might consider Class C for certain needs, such as Linux programs. Avoid Classes D and F unless you're looking for a children's program or have a specific reason, and even then, be very selective. There are many, many checker programs out there; every time I search the net I find new ones or ones not previously discovered. While a few are really worthy, most of them are pure junk. I review as many as I can, but I can't possibly buy and review them all, and in recent months (fall 2005 onward) I've not been trying to keep up with the all-too-numerous new releases of unworthy dreck. Disclaimer: the ratings and comments given here are my own. Your own evaluation will vary. You must do your own analysis prior to spending money or making selections. I take no responsibility and assume no liability of any kind. This review page deliberately limits itself in a number of ways, and uses certain groupings and terminology. I don't consider programs that you can play against on-line. I'm only looking at software that you can download, buy, or obtain somehow to run on your own computer, without connecting to the outside world. I only review programs with which I have personally spent sufficient time to get a basis for a fair and equitable evaluation. I do not go by ancedotes, claims made on web sites, or the reviews of others (with the exception of solicited guest reviews from reviewers I trust, who may have a program I cannot readily obtain; all guest reviews are so marked). This means that some world-class programs such as WCC Platinum, Colossus, Nemesis, and Wyllie are unfortunately not yet evaluated. But, I do plan to get the next release of Nemesis (if it is ever available) and review it in due course; and WCC Platinum is in my hands with a review to follow. Wyllie is no longer marketed and so unavailable to me; and the advanced version of Colossus would cost me about a week's paycheck so I don't plan to acquire it anytime in the predictable future. I have revised the categorizations of the programs. I used to group them by a subjective measure of overall quality and seriousness, but this resulted in ever-increasing clutter. I now simply group them by playing strength, and do subevaluations of features and other factors; I also give an overall final impression in a short phrase or sentence. Here is how I now present the reviews; the class system is meant to resemble the American school grading system, where 'A' is best, 'D' is bad, and 'F' is failing (there is no 'E'). Class A. A Class A entry is a serious, high-grade program with very high playing strength (one might say 'world class'). There are definite strength variations in this group, but these are the few and the proud. Class A programs give human grandmasters a run for their money. Class C. These are programs that are roughly as good as Simple Checkers. This is not at all a bad level of play, but it is not on a par with the better entries in the higher classes. Some older programs fall here as well; they were at one time in better standing but have either fallen behind or were not developed further. These give a good game to the typical checker enthusiast, but not to the expert or above. Class D. Class D programs lose to Simple Checkers consistently, but play along well enough to have given at least a credible performance. These programs are often non-serious 'toys' although there is an unfortunate number that pretend to be more than this. The programs in this category might play well enough against a "dub" or "scrub" but not against better competition. Class F. Class F programs are easily outclassed by Simple Checkers and don't even put up credible resistance. There are far too many of these; more than I can ever review and more than I can afford to purchase. With few exceptions, these are a complete waste of time and money; again, sadly, some make completely unjustified claims and pretenses. Even "dubs" and "scrubs" defeat these much of the time. I have tried to review the latest versions of each game, but in some cases I may have reviewed an older version. Please let me know if you think this is the case. I admit that I am often sarcastic and merciless. When someone is out there ready to take my money, I expect commensurate value. I will not be gentle with those who talk big and deliver little. If someone says they have a championship level program, they need to be able to back that up. And anyways, who am I, a poor player on a good day, to be reviewing checker programs? Well, I've worked with software for decades, played board games even longer, and I have ideas which I am not reluctant to express. You are completely at liberty to ignore my opinions! However, if you feel an injustice has been done, please contact me. Those who have done so have found me to be very willing, and in fact anxious, to correct errors. The program's feature set: does it have a lot of very useful features, such as game or diagram export? Does it have essentials, such as move or game review? Will it do analysis? Interface: is the program easy to work with? Less importantly, does it have an attractive appearance? Overall: Combining all tangible and intangible factors, how does the program stack up? This is done not as a letter grade, but with a few words or a short phrase. After some thought I decided not to separately rate program cost. I factor cost into the overall rating, and I comment on cost, but I go no further. I also comment on opening and endgame play: does the program have an opening book or an endgame database, and of what type and size? I do include screen shots for nearly all programs for which the review is complete. These screen shots are on separate pages so that this page won't have an enormously long loading time. I did prefer larger graphics to preserve detail and give a more accurate impression of the game's apprearance. KingsRow uses a very large calculated opening book of over 800,000 positions, and will handle the Chinook 8 piece endgame database and the Martin Fierz 8 piece database, making this engine formidable indeed. The author has recently calculated a 10 piece database which is something like 200GB, obviously not practical for download or even for usage by 99.9% of computer users (nor is it currently available to the public). I feel pretty good about having gotten a draw against it a couple of times; let's not discuss how many hundreds of games I've lost. It can be scary and formidable, but it's a fabulous playing partner for really intense and serious training (as I discuss in my companion article). It's also quite helpful in doing analysis of games you've played elsewhere. It's freeware, too. You can't beat that. Please see CheckerBoard for a screen shot. Endgame Database: Chinook 8 piece and others. Nearly all of the comments made about KingsRow apply to Cake Manchester (previous versions were Cake Sans Souci, Cake++, and others). The opening book supplied with the download version is calculated, and is just shy of 100,000 positions. There is an option to calculate the 6-piece database, which you should do at once, and then you can download a small (4 vs 4) subset of an 8-piece database. Cake Manchester does not use the 8 piece Chinook database. The author has separately computed an opening database with about 1,500,000 positions, and his own highly-efficient 8 piece endgame database. He is looking for a host to make these available for general downloading â€“ any takers out there? This is another world-class engine, and based on the competition version, at the moment likely the world's best, if by a narrow margin. I'm delighted that I was able to get about two draws in about a bazillion games. It too is freeware. Interesting note: Martin Fierz was kind enough to write and tell me of the origin of the name 'Sans Souci' (a previous version) which of course means, 'without worry.' But the name comes from an apartment building at the Diamond Head end of Waikiki where Martin resided while attending grad school at UH Manoa. Certainly a beautiful and inspirational part of the world. Endgame Database: 6-piece (in the distribution version; 8-piece database may become available, see above). CheckerBoard is an interface, not a complete game-playing program. With it you use any of several engines. Cake Manchester, a world class competitor, comes with CheckerBoard; but you can also use KingsRow, another world class engine, or any of several others of lesser strength. I have just upgraded to version 1.611 and CheckerBoard's feature set continues to grow (and there is an even more recent release just out that improves the database search capabilities). CheckerBoard has one of the most plain displays of the lot. The pieces are just colored circles on a square grid (the earlier slightly-off-square problem is fixed). Moving consists of clicking on a piece, to highlight it, and clicking on the destination square (you don't drag and drop, and in the case of multiple captures, you click on the very last square, which can be a bit disconcerting at first). PDN game export to the clipboard and game import from the clipboard. FEN (position notation) import and export to and from the clipboard. Graphical export of the game board. Complete, flexible search and recall in extremely large databases of games in PDN format (thousands available on the internet). There is a lot more in the way of options, features, and play aids. CheckerBoard may look plain but it's as good as you'll find anywhere at any price--- and it's free. The only interface feature that I would like to see added is a separate window or panel showing the game moves. As it stands, you can get that in the analysis, HTML export, or clipboard, but not directly along with the game. There are also now some new drop-in graphic sets to alleviate the 'plain' look. A screenshot is here (as of version 1.601). Opening Book: Depends on engine chosen; will handle enormous sizes. Endgame Database: Depends on engine chosen; will handle 8-piece databases. Review to come when version 2 is released and I buy it, as planned. By every account Nemesis is world class in every way. NOTE: Sage is no longer available. Sage 9.0 is a very nice shareware program with good playing strength, an attractive presentation, and numerous features. The 'full' version is only $19. The policy on upgrades is not clear but the author has been more than willing to send them to me without additional cost. As one of the strongest programs in Class B, Sage plays a very strong game indeed. A feature that you might or might not consider an advantage is that the Sage opening book appears to be based on published play. (I say 'appears' because the documentation is not clear about this. But it looks to be this way.) I personally find this useful; I can compare my moves with published play later on and see howthey may differ. Sage will use the Chinook 6-piece end game data base as well (although it seems up to you to be sure it's installed). Sage shows 3D images of pieces on a plain square board. The colors are far from official, but you can make them anything you wish. Don't. I got official green and buff colors set up only to find that the pieces can't be changed, and they don't go well with an official board. So, live with the off-color colors. Sage displays numerous windows: the opening book (very nice), the lines of analysis, the game record, and the board itself. Piece movement is a very appealing drag and drop, although if a piece has only one legal move, the piece runs out from under the mouse and makes the legal move, an effect that can be disconcerting. The feature set is very good. There is the usual import and export of games in PDN format, and there are some very nice database features. The program comes with a large database of games, and you can add more from various sources on the internet. The database search feature is especially well done; you can search by player, by date, and notably, you can search for positions similar to one you're interested in. The database features seem to be among the most complete and extensive of any program I've reviewed here. You can also look at positions and groups of positions, although this is a feature I don't fully understand (and it's not in the shareware version). Analysis is a little non-intuitive (it took me a bit of time to figure it all out) but you can drop in games and get an analysis of the moves; this is a useful feature. Sage, in my subjective judgement, seems to have a less 'intense' overall feel than KingsRow or Cake. (Sage allows substitution of engines, though, at the loss of some features. Cake will run with Sage, for instance.) This does not mean that Sage is not a good playing partner; it is an excellent one (I've managed two draws with Sage in quite a number of games). In my own practice play, I often alternate between Sage and KingsRow. Sometimes I just want that 'softer' feel and a look at Sage's opening book. If you want a shareware program, this is the best $19 you will ever spend. Openings Database: Medium (at least). Endgame Database: Can use Chinook 6-piece. Overall: Excellent value and probably top of Class B in strength; was at one time world-class. Nexus 99 (full version) Review in progress.ï¿½ NO LONGER AVAILABLE. A strong program with excellent features, including identification by name of the opening being played. This is the predecessor of Nemesis; you could think of it now as the little brother, but it is a real competitor. It is available as shareware on a trial basis and in a full version, on CD, for $25, which includes large ending databases. If you don't want to go all the way and buy Nemesis, certainly this is an inexpensive and most viable option. The program is loaded with play features, from good opening databases (which appear to be published play rather than calculated, but I don't know this for sure) to game analysis, and fine-grained control over all important game settings. A screen shot is here. Overall: Excellent value in a program that was once "world class" and shows it in every way. The display is very nice and unique among high-end programs; it is a 3D perspective of a marble board (much like the faux marble one on my coffee table), and pieces that remind you of the stacking plastic ones that you buy in toy stores (but these at least are not red and black). There are a few different display options, but no way to get a top-down view. There are two main features lacking in the Gold Plus version. First, and least important, game import and export is pretty limited. Second, and quite important, is that there is no analysis mode as such. There is autoplay, but no facility for dropping in and analyzing a game you've played yourself. Opening Book: Appears medium to large. Endgame Database: 6 piece "perfect play"
Overall: An excellent entry in all respects. NOTE: Blitz is no longer available. 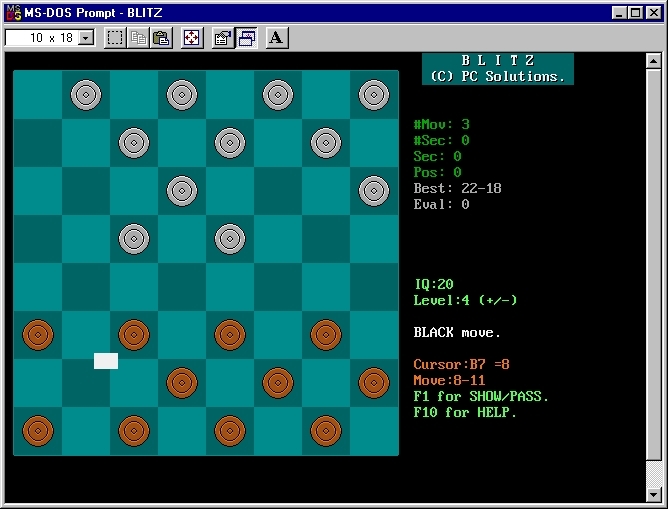 Blitz is an older DOS game that was a predecessor to Sage. In its time it was a 'very serious' program and is downgraded only due to extreme age. I list it here because I actually use it, on a couple of my ancient machines, like my Honolulu computer. It has the advantage of being small (about 30k!) and very portable; I sometimes run it from a bootable floppy disk (see my web page on bootables for an explanation of this concept). Blitz plays a rather strong game. It is certainly stronger than Simple Checkers. It has a small built-in opening book which is certainly adequate for a few moves or so, and there is an undocumented option for adding an external opening book, which I have yet to figure out. Like many older, smaller programs, it plays a good tactical game. It won't miss, or allow, shots and combinations. It has a bit less of an understanding of positional play, of course, but it does well even in that regard. The author has now released the full version as freeware, making it available to all; this is a very generous move on his part and he deserves our thanks and support. There are a few nice features: you can play back games, and scroll back and forth within a game; you can save and restore games; and you can set up positions for study or for computer autoplay. To move pieces, you drag and drop with the mouse, or use the keyboard to move around a giant cursor, and select pieces and destinations (use the mouse, trust me). When you select a piece, legal moves for that piece are shown in a very irritating manner, with the legal destination squares flashing on and off, and if the speaker is on, an annoying continual beep. The board is plain and done in odd colors, but it's practical enough. And you can run in CGA mode if you wish, making this program compatible with the oldest of DOS computers. As I said, I use Blitz at times. I run it from a floppy in environments where I don't want to install software to the hard drive. I also run it on some ancient hardware just for fun or when that's all that is available. And an important feature is that it runs perfectly under Linux using the DOS emulator. It is not my playing partner of choice when I'm able to play Sage or KingsRow, and I even won a game against it once, but it is still an interesting piece of history that plays well and credibly. It is very probably best-in-class for DOS programs (and I plan a 'playoff' to find this out definitively). I managed to get this screenshot, which has a small white artifact which I invite you to ignore. Overall: Very good for what it is and plays a strong game. The only real reason to review Cake++ (having been long superceded by the rest of the Cake series) is because it is an engine option for Xcheckers and Capers. This is likely to be a strong Class B entrant. Author Martin Fierz, by the way, has an update in progress (February 2005) supplying Cake++ with a very large opening book, which will make this a formidible Linux engine. Capers is a relatively new engine interface for Linux systems running the Gnome desktop. It runs both Simple Checkers and Cake++ and represents a substantial improvement over the XCheckers interface, though if you are not running the Gnome desktop it won't be an option for you. Some years ago, Jon Kreuzer started work on a checker playing program as an experiment in developing game-tree searching code. The experiment was refined over time, and when a graphical-user interface (GUI) was added, Jon gave his program a logical name: GUI Checkers. The nascent GUI Checkers got the attention of world-class checker programmer Martin Fierz (creator of CheckerBoard and the Cake series of engines), and Jon was inspired to invest additional effort to improve GUI's playing strength and features. We put GUI through its paces here, first running our standard test against Simple Checkers. GUI won easily, and we wondered just how far GUI might go. We next tested against Marujito 1.08a, which itself can defeat Simple Checkers. GUI won that encounter as well. So we kept pushing. We then ran GUI against the solid Class B engine Damas 99. The result was an interesting draw (click here for an animation), played without error or missed opportunity on either side. But we had a hunch, and so we played GUI against Nexus, the strong forerunner of the world-class Nemesis program. Amazingly, GUI won the encounter! Of course, one game doesn't tell the whole story, but the win was most impressive, and you can click here to see an animation. GUI Checkers 1.00 is thus established as an excellent Class B entry. It doesn't beat the Class A programs, but it certainly plays a very worthy game. GUI features a small opening book and a small endgame database, a really nice look and feel, serious-minded features such as FEN and PDN import and export, and basic features such as move review and the like. GUI has a small opening book and a small 2x2 endgame database. A large screen shot is here. Overall: A top notch entry in Class B. The author calls his program 'very strong' and that is somewhat understated. While it isn't world class, it certainly plays very well indeed. In my standard test run, it handily defeats Simple Checkers, showing that the authors claim of strength is in fact substantiated. (It draws against the strong Class B program GUI Checkers.) This is a very compact program packed with playing ability and everyone should get a copy. Of course, the weaknesses are evident: there are no opening or endgame databases, and the features are basic (save, restore, set-up, undo moves). There is no move list, analysis, etc., but then again, this is a small and unpretentious item that just happens to play a fine game of checkers. It is no longer in development and one wonders what it could have become had it been pursued further. Overall: A nice entry and worth playing for variety and more than sufficient challenge for most of us. Overall: A great choice for quality casual play. Wincheck is an interesting sort of a thing. 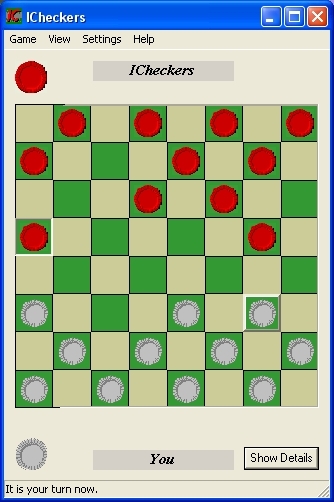 It is part of a series, a rather large series, of similar looking checkers and draughts games done by a Franco-Spanish programming team. They make the claim that these are the most graphically and visually spectacular of all checker programs, and there is some truth to that claim, along with some problems. The authors claim that 8x8 American/English checkers is not their game, and that the strength of their program could be higher. Perhaps that is true, but the program plays a reasonable Class C game notwithstanding. The opening book is adequate (I imagine it is based on limited published play; it has that feel), the game's tactics are strong, the move searches are good, and the positional play is fair enough. This isn't Nexus or Sage, but it isn't third-rate. Features are severely crippled in the shareware version (no move review, limited play levels, limited choice of graphics). The registered version gets you move review, more play levels and more graphics. But to use the full potential of the program you need the $50 analysis version. Like CheckerBoard, the analysis version lets you 'drop in' a game and have the program suggest alternative moves based on its analysis. The actual move made in the game is also scored so you can get a relative idea of how the actual and recommended moves stack up in quality, a very valuable feature. However, I would am not sure I would trust the analysis capabilities of a Class C program; you're better off with a Class A alternative. You can export and import games and positions, but I didn't see a feature for graphic exports, nor did I see anything for database searches; overall this makes the feature set substantially weaker than CheckerBoard. Piece movement is mouse drag-and-drop. The program has a very nice and unobtrusive way of highlighting the set of legal moves once you've picked up a piece. This isn't really necessary in 8x8 American/English checkers, but I'm sure it's a holdover from the other games in this series. I do play this one for variety at times. I win once in a while, and draw a little. In my now-standard test against Simple Checkers, Wincheck draws, but seems in control most of the time, so I'd give Wincheck the slight edge. You can view a screenshot here. Opening Book: Small (as near as I can tell). Overall: Visually stunning and plays a satisfactory game. Maverick Checkers is an interesting game. It can be both played using a web browser or as a regular standalone application. This game can also be played on several operating systems. It plays a nice game of checkers. I'm not the best of players but I do pretty well in various online checkers sites. I have yet to defeat Maverick Checkers on the higher levels which is a bit frustrating a times but atleast you can change the difficulty levels. You can play either by time or ply. Although Maverick Checkers will easily defeat the average player, I doubt it will do the same for those at the grandmaster level. Of all the checkers programs I've played, Maverick checkers has some of the best features. It has all the basic features such as loading, saving, and setting up games. It also auto plays games in PDN format, which is nice. Sometimes I watch my previous games without having to continuously click the next button. 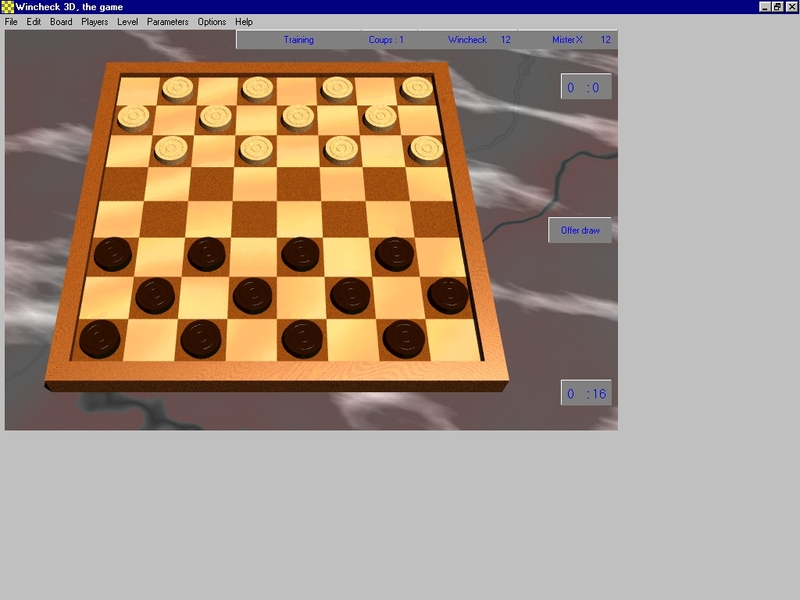 The game also has a feature to export to HTML similar to that of CheckerBoard but even better! It also contains analyzing capabilities but I won't put much trust in it. If you want to analyze your games, I would go with Cake or another one of the stronger programs. The game has several nice pieces and board designs to choose from. There are a lot of other features available which are listed on the game's website. All in all, I would recommend everyone to try this game. It is Java-based, and you can play it online in your web browser. 2) Gui Checkers, 3) ICheckers, 4) Simple Checkers and 5) Diamond Checkers. As it turns out, the games didn't turn out to be as fair as I initially thought it would for the programs that offered only time settings. Maverick checkers was the only program that stayed within the time limit most of the time. The others substantially exceeded the time limit quite a bit. Maverick Checkers has several available engines but I only used the default engine for the comparisons (Mav v0.70). Versus Damas: Damas handily defeated Maverick Checkers in the matches. All the matches were time based. Versus Gui Checkers: This match was a little more interesting that that with Damas. In the game based on 2 second think times, Maverick Checkers put up a good fight until towards the end. Gui Checkers however tended to exceed the time limit a lot. In the game based on equal level/ply, Maverick Checkers won some games and drew the rest. Gui Checkers however seems to perform better towards the end of the game which may be a result of the endgame database. Versus ICheckers: This was not much of a competition at all. Maverick easily defeated ICheckers in all of its matches based on both time and ply. Versus Simple Checkers: The games where close but Simple Checkers won most of them and drew the rest. Once again, Simple Checkers used more time per move that Maverick Checkers which probably affected the game outcomes. Unfortunately, I couldn't put them in a match together based on ply. Diamond Checkers: Finally, I compared Maverick Checkers to Diamond Checkers. This was particularly interesting because both programs are written in Java and can be played through a web browser. Maverick Checkers defeated Diamond in most of the games and drew a few. 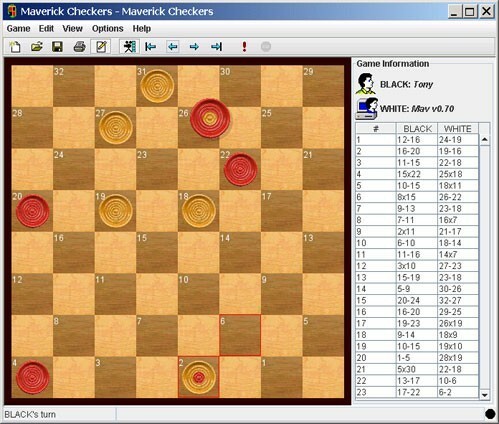 Other Checkers Java Applets: Maverick Checkers easily defeated all the other checkers applets I matched it against. As a matter of fact, it also defeated these programs. strength. This is a well done game. Webmaster's Note: We thank Mr. Billings for his review. We are in quite close agreement with it. Maverick was a pleasant surprise, combining some well-thought-out play features with an engine that plays a reasonable, if not great, game of checkers.ï¿½ Click here for a screenshot. Deep Brew appears to have started out as a very ambitious project, and changed directions somewhere along the line. The author says he is going to restart, and I certainly hope he does. Deep Brew as found (or as left) is rather a nice piece of work, and as it is free and open source, it provides a lot of value. The author has recently (as of January 2004) released an upgrade to what he called 'The Ancient Legacy Version' for Windows. This upgrade provides some essential new features and some bug fixes and cleanups, and significantly increases the appeal of the program. Despite having no opening book or endgame database, Deep Brew plays quite a decent game. I set it to one second think time on my 2GHz Pentium, and I have a lot of trouble keeping up with it. It is a good tactical engine; I imagine it interprets position play in terms of material, but the search tree is good enough to make this come out right. Deep Brew is a worthy opponent indeed, and I find myself drawn back to this program when I want a change from the high end superhuman machines. The feature set is somewhat developed, even if much less comprehensive than some of the more-developed world-class programs. You can set up positions, take back moves, and work from a well-formatted move list. You can also do position analysis (although it appears to be a bit of an effort to get Deep Brew to play both sides, and I wouldn't trust the analysis all that far). The graphics are very nice with a clean click-on-piece, click-on-square play interface. The squares are official green and buff, and numbered with discrete little numbers that are not at all intrusive or bothersome. The pieces are official red and white. Deep Brew drew against Simple Checkers; Deepbrew was a man down but Simple Checkers allowed draw by repetition. Tsk, tsk. Deep Brew played credibly and is likely short of Simple Checkers in strength; I don't consider it strong enough to go in Class B, but it clearly doesn't belong in Class D; hence, Class C! Given additional development work, such as an opening book and a much needed endgame database, Deep Brew stands every chance of being a contender some day. I wish the author luck and success. Overall: A nice entry with a lot of potential. 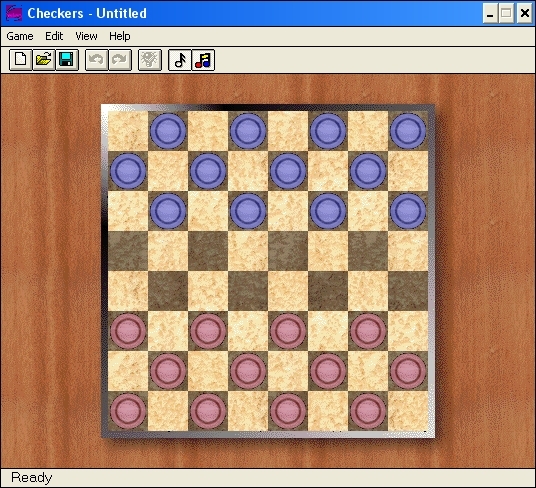 XCheckers, like CheckerBoard, is an interface and a display system, and uses other game engines. 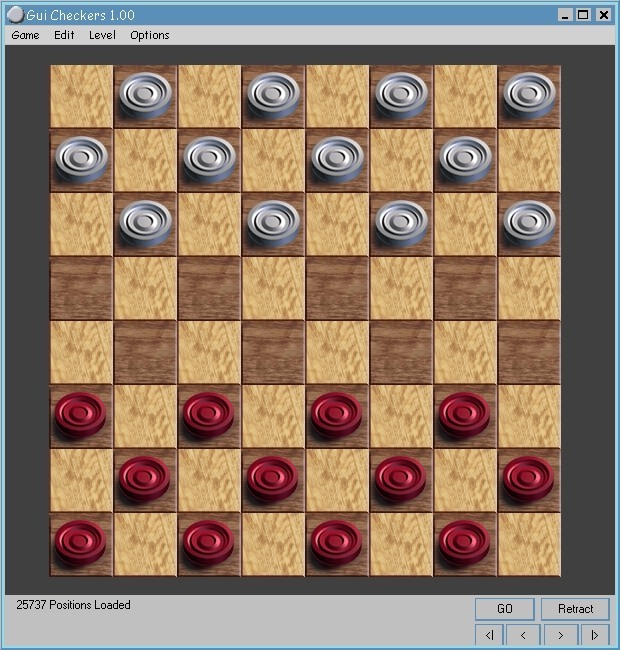 XCheckers works with the Simple Checkers game engine (and recently also with Cake++), which is reviewed below. 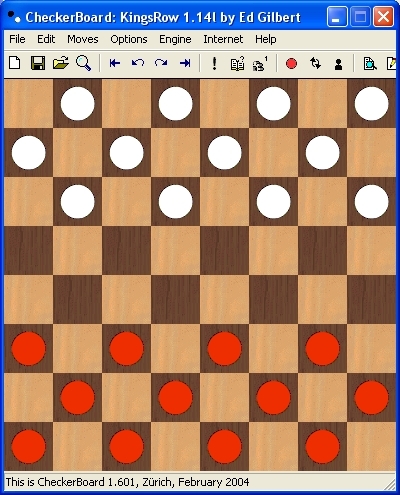 XCheckers has few features, but at least you can scroll back and forth among moves. The display is nice enough, with very nice 3D checker pieces. 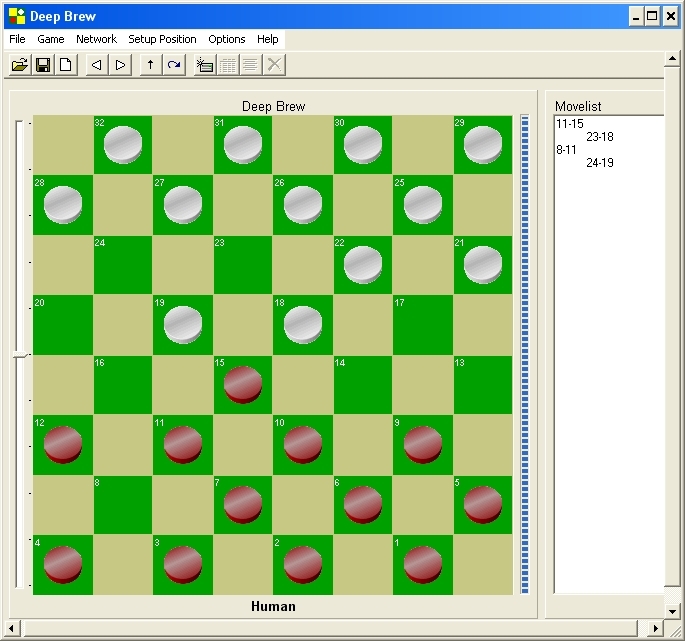 XCheckers is a Unix-only freeware product. It is also intended to be a client for an International Checkers and Draughts Server (ICDS) which, to my knowledge, no one runs any longer. Recently XCheckers has been made to work with the Cake++ engine, an ancestor of Cake Manchester and earlier versions in the Martin Fierz Cake series (e.g. Cake Las Vegas, Cake San Souci, etc.). Cake++ (to be separately reviewed in the future) is open-source and utilizes the Chinook 4-piece endgame database. It is a rather strong program. This now gives us a very usable Unix option for checkers. In addition, a new interface is in development with many more features (a beta is available; more on this in a future review). I finally have a screenshot. Endgame Database: None with Simple Checkers; Chinook 4-piece with Cake++. Overall: A good option for Linux systems. The whole thing stems from serious work in the field of artificial intelligence. The author took the early work done by IBM in applying neural network techniques (called here 'Darwinian') and extended the concept. The result is a program that the marketers claim plays at the 'certified expert' level. At least that's what they say. The display is well done, with a choice of beautiful background photos from around the San Diego area, including the harbor, the Hotel Del Coronado, and other famous and recognizable scenes. To the game's credit, the board is green and buff with red and white pieces. They did their basic research. There is a 3D-board shown in front of the actress, and a larger 2D board to the right where you click on piece, click on square to make your moves. The two boards update simultaneously. It is very appealing and very well done. Check out this screen shot; I've made it large enough to be representative, so it may take a little time to load. There is also quite a bit of interesting background material on how the program was developed. Some of it appears to disparage or downplay the conventional approach to programming checkers in favor of the neural net approach; this seems a bit out of line especially considering the relative playing strengths, as will be seen. Or perhaps the point is simply that Blondie24 reaches a claimed high playing level by the new approach; but that isn't quite true either. The author wrote a whole book on this: 'Blondie24: Playing At The Edge of AI.' He took it all quite seriously; in fact, he did serious work with seriousness of purpose. So, how well do these California girls play? 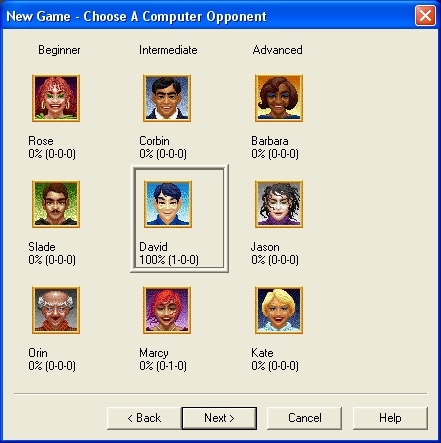 You can choose three opponents with three levels each: Novice, Intermediate, and Advanced; or you can go all the way and play Blondie herself at the Expert level. I tried Novice and Intermediate and there was no competition at all, so I went on to the Expert level and did my usual test. Blondie24 faced off against Simple Checkers. Simple played White and had 5 seconds per move. Blondie24 took her own time (you can't set it)and used typically 30-90 seconds per move except for forced captures. Result? With all the time Blondie24 took, she managed a draw against Simple Checkers. Simple had a little bit better game; Blondie24 made one terrible positional play but Simple didn't exploit it well enough. At a deeper search level (more than 5 seconds) Simple might have won. In the end, when a position repeated over and over with neither engine willing to try anything else, Blondie24 refused repeated draw offers, finally telling me, 'I don't THINK so!' and then no longer responding at all. I did a later rematch with almost identical results. Blondie made one error but Simple Checkers didn't catch it, and the game drew again through repeating positions. You can view an animated, commented version here. The comments are my own interpretation of an analysis I ran with KingsRow. Notice where Blondie makes what might be a losing move but Simple Checkers just can't look far enough to see it. But as I state at the end of the commentary, we see here two Class C programs making only a single real mistake each in the course of a game. (There are numerous moves that could be argued as a bit less sharp than an ideal move, but this is usually by the finest of margins.) The state of the art in checker programming is pretty good these days, when even programs rated way down the line play this kind of checkers. There are no game review features, move lists, position set-ups, etc; not even saved games. This, folks, is checkers for amusement, California-style, and not for serious competition - although at the expert level Blondie24 is going to defeat most casual human players. It rates a 'C' in playing strength by virtue of a draw with Simple Checkers, and thus escapes the 'Don't Waste Your Time" award, although the packaging and marketing certainly could have put it there. But this all overstates the merits of the program as a checker engine. It's good enough, but not remotely as good as Sage or Nexus, which sell for roughly the same price. 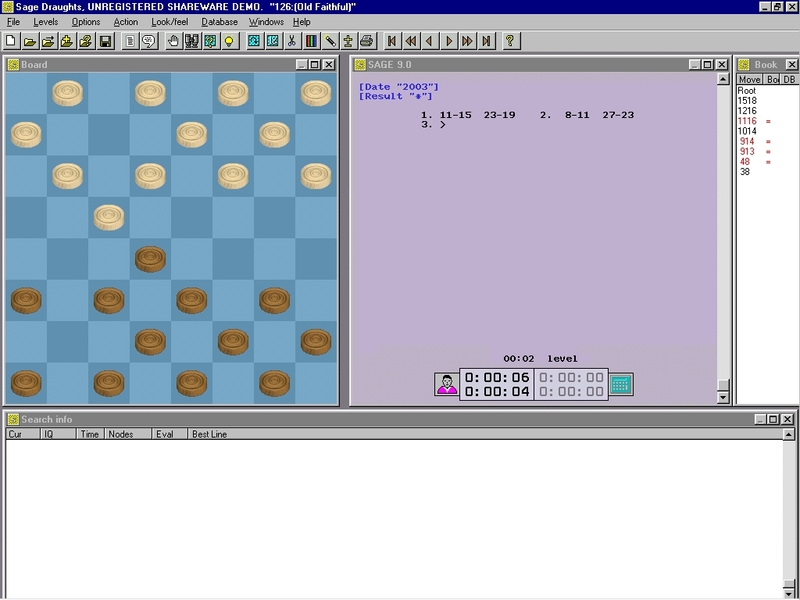 It falls short of the small freeware program Damas99 in every respect; and while playing almost even with Simple Checkers (with a huge time advantage) it offers none of the features of the free CheckerBoard interface. Despite the comments made in the supporting material provided with the game, the neural net approach doesn't seem to make it in checkers. Top checker programmers today find that the opening and ending databases are critically important. And they've got the search algorithms and corresponding evaluation criteria very highly tuned. As mentioned in an earlier review, neural net programming dominates backgammon. Neural net backgammon engines play at the world class level. Perhaps this is because backgammon is a non-deterministic game. But it hasn't seemed to work out for checkers. Should you buy Blondie24, "Checkers With An Attitude"? The game is a hoot to play, but ultimately, no more than that. It's amusement, not serious checkers. And that is a shame. This started out as a serious project to apply neural net techniques to checkers. It didn't come off in the end as a true expert player, but the attempt was well-made and shows it. Turning this into marketing silliness is a real disservice to the genuine scientific work done by the program author. Overall: A serious effort marred by lack of features and off-the-wall marketing that turn this into just a toy. Simple Checkers is a surprise and a treat. It is indeed "simple" but that does not speak to the astonishing quality of this very small package. 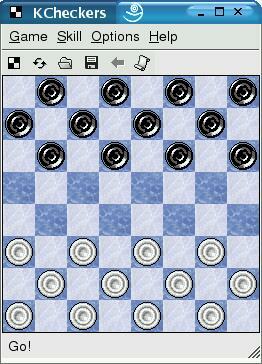 This engine is used by XCheckers, but can be used by several others as well, especially CheckerBoard. It is free, and it is supplied with source code so you can see how it works. It plays a fine tactical game; in fact, it fooled me into thinking it had a small opening book, but in fact it was just doing a nice job of calculating plausible moves. Positional play, as is typical with engines of this type, is not the strongest point. And it has enough trouble at times winning end games. But the search tree is quite well done. Simple Checkers is certainly weaker than Sage and Blitz, but it is fun to play against. I'd say it's more like playing another human than most other checker playing engines. I use it mostly because it will run under Linux (Cake++ and Kcheckers are the only others). I enjoy playing against this engine, but I generally don't fare well. It can be frustrating to be outplayed by a small amount of C code! Now, a few editorial comments. Simple Checkers, which makes no claims or pretenses, will outplay anything in Classes D and F, including some that really put on airs. Martin Fierz, the author, freely publishes the source code for Simple Checkers. It's indeed simple; maybe 2,000 lines of C code, much of which is a rudimentary text interface. The actual logic for choosing moves is quite brief and very easy to understand. There are some basic rules: a cramp on the enemy is good, a king in the center is good, etc. Just plain old basic principles. And it beats the daylight out of just about every non-serious program. In fact, I benchmark other programs against Simple Checkers, as you've seen here. So, with the very effective Simple Checkers rule set available for all to copy and improve upon, why do so many of the 'toy' programs make wild claims about playing strength and deliver next to nothing? Copy Simple Checkers and at least play a decent game! I simply can't understand it. Is it laziness, ignorance, or just lack of respect for the customer? Even more humorous (or sad) are rule sets that are incredibly stupid. One of the programs below thinks that kings are good, and advanced ranks are good, so it will make a single king and forever shuffle it back and forth between the seventh and eighth ranks. 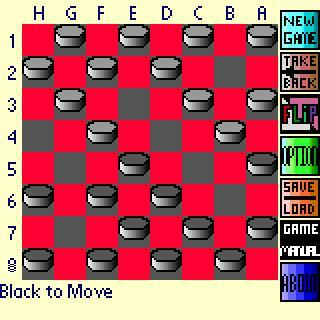 Simple Checkers puts most of the checker playing programs out there to shame. Literally. Overall: One of the best of the non-pretentious programs out there. Marujito is named after a yellow canary that is a character on the Barcelona television comedy show Plats Bruts. It (the engine, not the canary) runs with the CheckerBoard interface, and was developed by Angel Galan Galan of the University of Barcelona. He bundles it under the name Matilde with two other engines that play European checker variants. Well, this new kid on the block is no comical bird, despite its name. Marujito clearly outplayed Simple Checkers in my standard test game. The game was a very interesting matchup, with Marujito calculating a pretty way to win a piece and then correctly winning a 3 kings vs. 2 kings endgame--- something that the more basic programs very often fail to do. Further testing against Damas 99 yielded a draw, and Damas 99 is a rather strong Class C program, meaning that Marujito is as well. The program author continues development, so only time will tell how far this very promising engine will go. Overall: A very exciting and promising new entry. Plus 700 bills itself as a 'self-learning' program. You will have a hard time verifying this, though, as the demo version has that feature turned off, and you have to buy the standard or "professional" versions at $17 or $37 respectively to get this feature.... or just about any other feature, including time controls longer than 3 minutes per game, analysis, databases, etc. This, folks, is what we call crippleware. The web site is pretty disorganized and I had to work at it to be able to determine the difference between the standard and professional versions, other than $20 in cost. Well, having gotten that off my chest, I found that it plays a so-so game. The interface is a little annoying; you click on a piece, drag the mouse to the destination square and click again. But there are no predictable visual cues; sometimes pieces and squares are highlighted, sometimes not. I've yet to figure this out completely. The program shows a little running graph and statement about how it thinks it's doing, such as 'I have a very great advantage.' This is quite entertaining although I suppose it could be classed as low-level psychological warfare. There are several analysis modes and a number of otehr features, but the documentation is mostly non-existent so learning how to use these features is difficult or impossible. It would not run on any of my machines until I installed a patch; be sure you do the same. The program supposedly has an opening book but I haven't figured out where or what it is, or how good it is, if it exists. I played Plus 700 against Simple Checkers, which is my reference standard for medium strength. Simple Checkers easily won, even allowing Plus 700 to continue to calculate positions while Simple Checkers was thinking and while I manually entered moves! The program undoubtedly has potential, but as it is a weak player, and is hard to figure out, there is no reason to spend any money on this when you can buy Sage or Nexus instead. A screen shot can be found here. Overall: Too much trouble for too little reward. Here is another highly crippled program that is very difficult to evaluate in the shareware edition. But I must admit that Iwas fascinated with it, and sent the authors the $19.95 registration fee. Actual Checkers has a reasonable, if small, opening book and sometimes has a concept of endgame play, and sometimes not, although the authors say they have built in endgame intelligence. It plays a better game than you might expect, even on tight time limits. That is not at all to say that it plays particularly well. Here, by the way, is an interesting thing. You can't set separate time limits for the program and for you. If you have 10 minutes, the program has 10 minutes. Period. While this is challenging, you can't even the odds by giving the program 2 seconds per move and giving yourself all the time you want. The operational paradigm here is that of a match, not a practice game. Now, this is not all bad, and in fact has a startling advantage. If you are like me and have trouble with speed games, being not quite able to click the mouse all that fast, you can set up one-minute games and practice, practice, practice. Then when you play a speed game on the net you may have half a chance of keeping up! There is another way to alter playing strength, though. The game has a number of pre-rolled personalities, from the 'Kid' who is a weaker player, all the way to 'Einshtain' (I just love the Yiddish rendition) who is the strongest. You can fiddle with the move evaluation parameters, too. This is an interesting feature, which has both charm and value. The screen and the interface are fine; the animations are a little slow but you can turn them off. The screen is made of a bunch of separable windows and you can move them all over the place if so desire. I'm not sure what this adds. Overall play quality puts this into Class D. I had expected much better. I had first matched it up against WCC Gold Plus, and Sage; to be sure, Actual lost to both, but played credibly in a 3 minute game. I need to go back and play more and longer games, for the reason cited a couple of paragraphs below. The greatest weakness of the program, besides unpredictable results in endgames (couldn't win four kings against two) is failure to use time properly. The program often uses gobs of time in the early stages of the game and then runs short at the end. I actually won a game in which I was two pieces down because the program ran out of move time! I think the addition of an endgame database and some work on time control are what the authors ought to look at next. But the program hasn't seem to have had an update in some time, and I am not sure of its current status in that regard. I was not able to evaluate self-learning mode. Perhaps I don't understand it well enough or perhaps I simply didn't give it enough time. But, above, I mentioned the need for further competitive testing. As I said, I've used this program a lot for one minute speed games. It wins most of the time, but then it's against me, and not an expert. 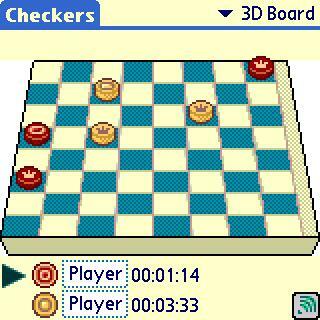 But recently, I've been playing games against Simple Checkers (also reviewed here) with the CheckerBoard interface. Simple Checkers, with no databases and just a good, streamlined search strategy, seemed to give me more trouble than Actual Checkers. Why? It didn't add up. So I played Simple Checkers against Actual Checkers, making things as even as possible, and setting the time control to five seconds per move. Surprisingly, Simple Checkers defeats Actual Checkers pretty easily. Actual Checkers opening book is evidently not anything like large enough to really matter. Perhaps Actual Checkers would have an endgame advantage, but I haven't really seen that yet; by the time the endgame is reached, Actual Checkers has been completely outplayed and is a piece or so down. So, is Actual Checkers that poor a player, as the Class D ranking implies? It seems so. But I have found one redeeming feature, and that is in the aforementioned separable windows. Since the display itself can be made to look very nice, and there is a position set-up option, I use Actual to generate large board diagrams to use elsewhere on this web site. They are very appealing, and very easy to do; and the separable windows allows me to just capture the board window and not have to do any cropping or touch-up whatsoever. Bottom line: the choice is yours, and while Actual Checkers is a nice enough entry in some respects, your money is much better spent on Sage, which is very much stronger, more complete, and in active development. Overall: Not nearly as good a player as you would have expected. The author expresses the laudable intent to show how checker playing programs can be put together. It is a free program with source code available. That said, the program is at present a fairly weak player and will not provide a lot of serious competition, at least at a reasonable play speed. It is a typical 'tactics only' player; it will find some shots and combinations, and avoid some, but not a lot else. As far as I can tell there is no opening book or endgame database. There are a couple of nice visual features, for example, three different board sizes and color customizations, although to my eye the board is just a bit off-square. There aren't, however, any real playing features, other than save and restore, and a running commentary on the engine's actions, from which with some effort you can pick out the game moves. 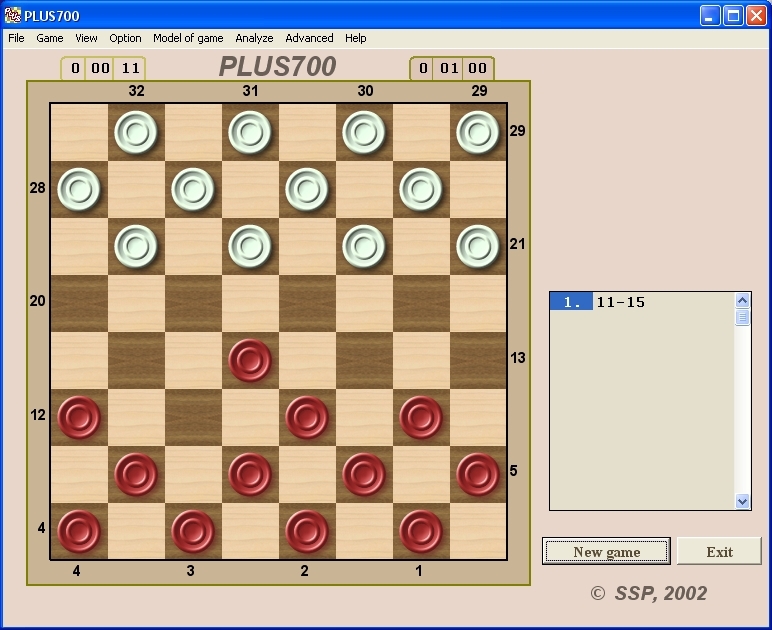 Computer play level can be set up by time per move, number of plies, or both. There is an option for a numbered board, but it is flawed. It shows the squares as numbered 1-32 from the top down, even if you are playing Red and Red is at the bottom. In the end, while this is a nice effort, it is outdone in every category by other free programs. It certainly has potential, though, and perhaps some day will become a contender. In the playtest against Simple Checkers, Simple Checkers won easily. This program barely makes Class D in strength. NOTE: Much newer versions are available; I have not reviewed them as yet. This little known but still currently marketed program very nearly won a 'Don't Waste Your Time' award because of the terrible display, interface quirks, and uninspired play, but it has some nice redeeming features which saved it from this terrible fate. Barely. The program is advertised as a DOS program, running on anything from DOS 5.0 right up through Windows XP. This claim is true, but the installation program will only run in a Windows 32-bit environment! If you want to run under DOS, as I very much did, you have to do an install on a Windows machine and then transfer the whole game directory over to your DOS machine. Not many other people besides myself will have the patience to do this nor is the reward for so doing very tangible. Well, on with the show. The display is truly horrible, a pure black-and-white with ugly pieces, with white kings that look like dishes and black kings that look like buttons. You have a choice of algebraic or numeric notation, but if you choose numeric, you can't get rid of the obtrusive square numbers. If you go to algebraic, the square numbers are replaced by chessboard style notation around the edge of the board, but the move list becomes algebraic; there is no real way to win this one. Features are reasonable. You can set up positions and let the computer play them out (but I would never trust the results); you can scroll through the moves of any game; you can click on a move in the move list and be taken to that position (this is rather nice). But the nice, and at least somewhat redeeming, feature is the game database. Over 18,000 historical games come with the program, in a searchable database. (The shareware version limits loading to 1,000 games.) There is a little mini-board that is on the database screen; you can set up a few pieces and the database will find games in which similar positions arose. The search is agonizingly slow, but the results are phenomenally good. I tried this with an endgame position and the program gave me back about 30 master games to browse through and learn from, all of them containing the position I specified at some point in the game. But it's really better than that, because the program will return the requested position even with 'extra' pieces on the board. In other words, it's a sort of fuzzy search that seems to be rather smart. Registration is outrageous at $49. Buy Sage instead and have $30 left over. This too is a marginal Class D entry. Here is a lovely screen shot. Overall: Not worth the money by any stretch of the imagination. Update: the author is currently (March 2006) working on a beta of a Windows version that is very promising and is orders of magnitude better than the old DOS version. Stay tuned for a review when ready! Here is an interesting pure-Java item. You can play on-line or, as we are interested in here, download and play on your own computer. It has the advantage of running on any computer that supports Java, and will run locally in your web browser. The author touts the program as 'very strong' and it indeed plays a good enough game for what it is. The match I set up with Simple Checkers was a very exciting tactical battle, with complex positions. Alas, in the end Diamond could not match wits with Simple Checkers, even though Diamond was set for 10 seconds of think time and Simple Checkers for just 5. Still, the game was credible, although the playing strength is perhaps not quite what the author thinks. This is one of the better Class D programs in terms of strength. Other ratings to come. No opening book or endgame database. Loses to Simple Checkers but puts up a good battle. Actually sacrificied a man to get an early King and a strong position! But then it blew the advantage away with a series of dumb moves and lost. This is another interesting item which allows for all sorts of variety play with a large compendium of rules sets (including Canadian) and the ability to play on an almost arbitrary size and shape of board. But I digress. It plays a fair game of American/British checkers when set at a high enough level. Against Simple Checkers, it played a credible enough game but of course lost. There is no opening book and no endgame database. When set at the highest level (called 'discus' for reasons unclear to me) it plays a passable game, losing to Simple Checkers while at least putting up a decent fight. I'll bet you've never heard of this little item. It was developed in the days of the BBS (remember those?) as a so-called 'BBS Door Game' and as such runs under DOS, although it will run in a Windows box. To run it you first need to load an ANSI driver. (Getting deep already, aren't we?) Back in the BBS days all of this was clear, but today.... not so clear. In any case, there are various options which apply only to a BBS environment. I'll just stick to the 'play against the computer' selection. You play on a board drawn with ANSI graphics, which is pretty nicely done considering the limitations of character graphics. Alongside the play board is a small board showing square numbers. You have a scrolling picklist of legal moves, which you scroll through with your spacebar, and select the move you want with the enter key. If this all sounds awkward, well, it is. Are you still with me? I hope so, because if you go through all the hoops you'll find that it doesn't play such a bad game even when set at intermediate difficulty levels. It plays quickly enough, even at high levels, not to be too annoying, as well. Of course, the author's hype about 'you'll never be able to beat it' at high levels, and his depiction of the attendant frustration on the part of the user, is not exactly to be taken seriously. Come on now, this isn't KingsRow. But in this category it's one of the better ones. It played a reasonable game with Simple Checkers, getting a draw twice in the two games I tried. It should have lost; Simple Checkers could not figure out 3 vs 2 or 4 vs 3 king endings and so blew away won games. Most of the other programs, though, lose to Simple Checkers long before this stage. So, while I still rate Bcheckers as 'D' in playing strength, it's a reasonable 'D' at least. This is a cute relic, nothing more, perhaps fun to play with a little for the sake of nostalgia. After that, though, you need to look elsewhere. I put this one in the 'don't bother' category because, frankly, using it is quite a bother. But it does play a fair enough game, if you want to bother with all that bother. A screen shot, showing the remarkable job that was done with character graphics, is here. Overall: It's actually sort of fun if you enjoy retrogaming and it plays better than you'd expect. In this category, I don't bother to rate opening book and endgame database content. You can safely assume that there are neither. There are many, many more programs out there that fall into Class F; I simply don't have funds to buy them all or time to review them all. But never fear, you're not missing out on anything. This one is really different, and rather interesting.. It's one of two programs reviewed (so far) that is based on neural networks. The neural network approach, which I can't begin to fully explain, relies on the program playing itself and learning from its experiences. It has proven very successful in Backgammon, and in fact the world class Backgammon programs such as GNU and Snowie use this approach. Its application to checkers has been quite infrequent, however. And it may be that that is with good reason. NeuroDraughts plays a weak game, sometimes making good moves and sometimes making incredible blunders. Perhaps more 'training' is needed, or perhaps the concept itself is flawed. 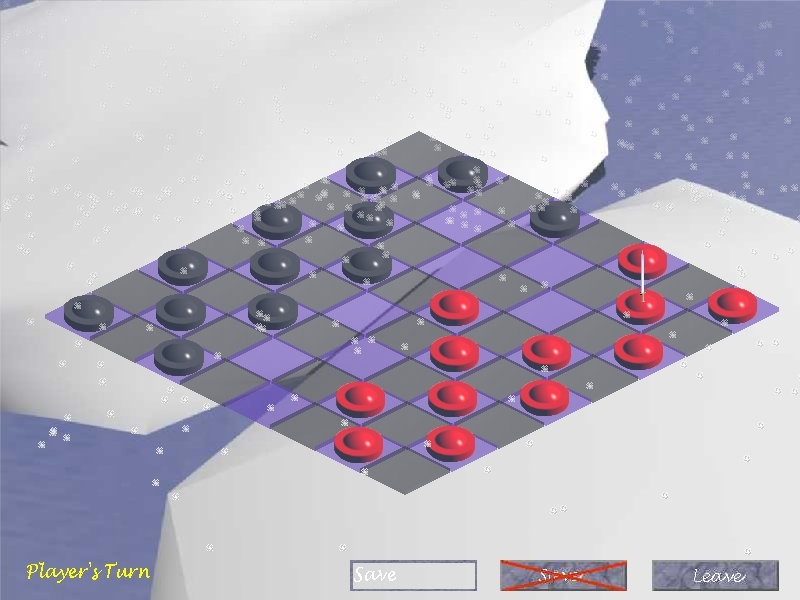 NeuroDraughts is easily defeated by Simple Checkers. 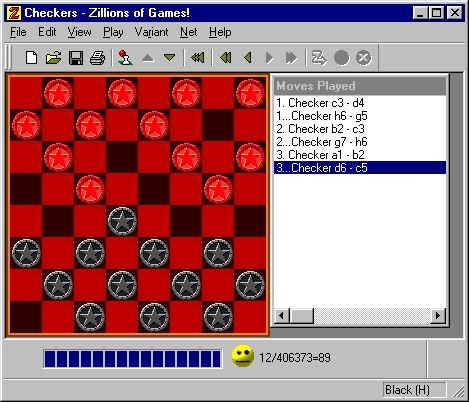 Zillions of Games is a unique and innovative gaming system that allows a single host or shell program to control the play of about a thousand(rather than zillions) different games. Many modules have been independently written for this system, including rare games such as Konane and many more. Generally speaking, these modules play pretty poorly. Given this, I found the checkers program better than expected, considering its lack of pretension and simple nature. This does not mean that it is good, however. To be sure, there is no opening database, and the program calculates 9-13 as the best move for black (an obvious bias toward tactics and winning and preserving material). Features? The program lists moves, at least, but in chess notation. You can move back and forth with move and game review functions, something I wouldn't have expected. There are also save/restore features. What is interesting is the possibility of writing your own checkers game module with your own playing algorithm, since the whole idea of Zillions of Games is to provide an open interface to allow creation of more and more game modules. Overall, again, this is better offering than I ever would have expected, but still, it does not play very well. It also provides many checker variants, such as Pool, Frisian, International, and a number of others. The price is $24.98 for the registered version, which is high if you just play the checkers module, but then there are all the rest of the games. A screenshot, of the typical red/black board, is here. Footnote:I contacted the authors about Zillions. It turns out that they did not write a checkers engine. They just wrote a 'rule set' and the internal, generalized game engine of Zillions ran against the rule set! My admiration and respect goes out to these designers. A general game engine of this type is no small achievement. Overall: A nice toy but not a serious player. KCheckers is pretty specialized in that it runs under the KDE environment of X-Windows of Linux (recent versions require Qt instead). This makes it even a bit more specialized than XCheckers. It can be difficult to install if you don't have the right version of Qt already installed. It offers few features (save, restore, restart), though the display is nice but rather small. It also plays rather poorly, even at the so-called 'master' level. And, for some reason, White moves first. You take turns playing White and Black against the computer; I didn't find an option to change this. This all sounds like a roaring condemnation, but in fact, it is not. The authors make no unsubstantiated claims for this work in progress (as of January 2004, the latest release number is 0.4). I am hopeful that KCheckers will improve, but there hasn't been a new release in quite a long while. KCheckers loses easily to Simple Checkers. Overall: There's not much here. If you are evaluating this game, be careful, as the evaluation copy runs just once! But it doesn't matter. There are three levels of play; I decided to start on the hard level, expecting to get at least a reasonable game with an understanding of tactics. Uh... no such thing. It is so easy for a lowly player such as I to defeat, there is little point, except as something to introduce children to checkers (of which more below). Another example: I wanted to see about endgames. In a situation with five kings against one, with the lone king in the double corner, this program could not get a win. To be sure, there are nice animated graphics, and the boards mostly look quite nice, even if some of the colors are a little odd. They are presented against vivid backgrounds and look almost as good as Wincheck, which is discussed above. (There are several options including the inevitable red and black.) As to features ... wait, did I say features? Well, this is a toy, so I guess I shouldn't look for features. 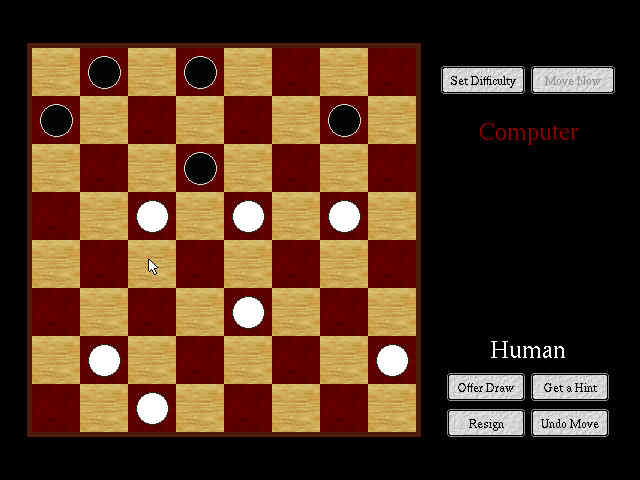 It just plays through a game of checkers, with sound and graphics and animations. There is also an option to play against others either directly or via internet server, but I haven't gotten this to work yet. This program should by rights be given the "Don't Bother" award, but I think it might just be engaging enough to introduce children to checkers, at least until they learn the rules and learn a little technique. Of course, the playtest against Simple Checkers ended with an easy win for Simple Checkers. A screenshot of one of the better board options is here. Overall: Might be good for the four to six year old crowd. This is a cute little item that, if set at a high enough level, will play about as well as Zillions of Games. The problem is that the search engine is extremely slow if you go to the upper skill levels. At the highest level, I ran out of patience on the first move on my 2GHz Pentium. There are a total of 10 levels; I went back to level 4, which is marked hard, and found that it plays fairly quickly, if not very well. At the higher levels, it's a bit better but certainly nothing like in proportion to the time it takes to choose a move. There of course are the usual problems with endgame play, and some odd ideas about opening moves. There are few features at all; just single level move undo. This game is just meant, I think, to be some fun for little kids, and it will surely succeed at that. I do, however, question the 'hint' feature which at times teaches incorrect play (9-13 is one of the hints for Black's first move). This is freeware, by the way. I think it is extremely nice of the company to offer this game at no cost. There are some humorous touches. At the end of a game, should you lose, there is a sound effect of a child's voice, in an imitation British accent, saying something like 'Thank you for playing checkers, sorry you didn't win.' Uh, that's draughts on the other side of the pond, folks. But I guess you can't blame them for trying. For some reason, I find this game completely charming. It has a friendly and attractive feel and could easily win young kids over to checkers. And that alone is a major merit. Here is a screenshot of a game in progress. Simple Checkers destroys Magic Wand, even with Magic Wand set at a level where it takes several minutes per move, but I am not surprised. Overall: OK for the kiddies and anyhow it's free. This is really not-so-fine checkers, at least for play quality. The shareware version will play at a so-called beginner and intermediate level; you have to buy the package to get to the "proffi" (professional?) level. The intermediate level tests out at the level of an educated five year old, so I didn't send in my money to risk trying the "proffi" level. The package contains several other games, nice graphics and interface, and a clickable move list, so there are some features here, and some attention to detail. But unfortunately it just can't play anything remotely resembling a decent game. A screen shot will come later. Overall: I can't see $15 for this unless you just want another nice toy. 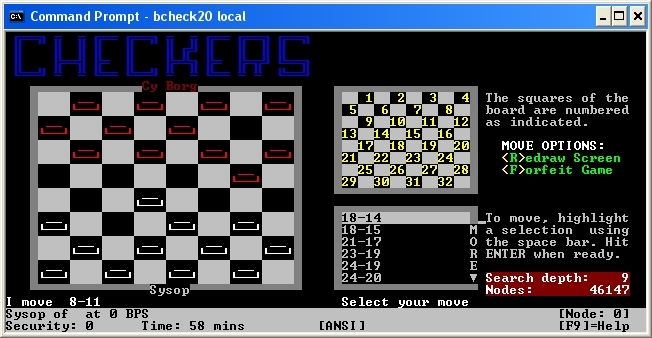 Net Checkers has a built in engine called the 'Zebra' engine which is not bad for a program of this type (which is to say, it's not very good either). The program will also accept 'drop in' engines such as Cake San Souci, which of course would make the program strong (thanks to Cake, not to Net Checkers). The 'net' feature of Net Checkers, though, isn't really worth the bother, as it offers nothing that on-line play or even Instant Messenger play can give you. 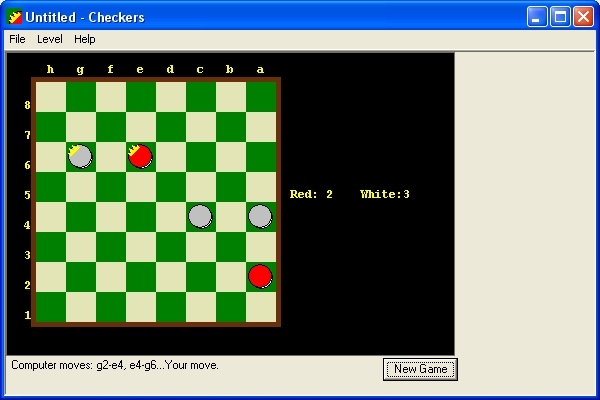 Net Checkers loses in a convincing manner to Simple Checkers. Master of the Board is a nice enough collection of games, including international rules and giveaway, the latter of which can be a bit hard to find. But as for American/British checkers, you'll need to set it to the, uh, 'master' level if you want any kind of game at all. And even then .... and of course it has no clue in an endgame. Against Simple Checkers, it played well enough until it lost a man, and then fell apart. This is pretty typical behavior; the program seems to no longer know what to do and starts making marginal or bad moves. Simple Checkers, of course, won the game. The shareware version of this game will only play at the novice level, and at that level it is a total waste of time. It has no opening book (duh), doesn't see the simplest shots, and seems to be playing giveaway instead of standard checkers, judging by the moves it makes. So I managed to borrow a registered copy just to see if it was any better at the 'advanced' level. Uh... it was better, because it could not possibly be worse, but it still played a miserable game. I can beat it pretty much at will. And, should you get down a piece or some such... play it out to the end. In an ending of one king vs. one king, where the program had the move on the lone king, far from the double corner, it couldn't figure out what to do in a case that required the barest of look-ahead. The author's claim that this program can be used for tournament training is beyond comment. It is perhaps that sort of unsupported, swaggering statement that causes me to be especially caustic in my evaluation. Needless to say there are no features other than save and restore. The graphic presentation is average, with red and black pieces on a dark blue and grey board. The black pieces blend into the blue squares and are hard to see. Maybe this is stealth mode? Strategist Checkers is utterly demolished by Simple Checkers. This is a very undistinguished program, even as a toy, and I am happy to bestow the "Don't Bother" award upon it. The full registered version is $10. Add a few dollars and spend that money on Sage instead. A screenshot, if you really want to see it, is here. Overall: Don't waste your time and certainly not your money. MVP Software is a venerable name in the shareware business. They've been around for quite some time and they have always offered reasonable value for the price. So, I was anxious to try MVP Checkers. The presentation is very interesting and somewhat typical of MVP games. You choose your opponent from a set of named personalities, at three different levels of play. I tried it out at the medium level, and was able to win pretty easily. The program is one of those typical material conscious things: attack a man where you can, defend where you can, and look for simple shots. The depth of search seems to be, well, not so deep. I went back and tried the beginner level, and curiously enough (or maybe not so curiously) the beginner and medium level of play seemed about as good (or about as bad); I couldn't really see any difference. It couldn't figure out four kings against one. If you play White, you play from the top down, because this program will not reverse the board! In a drawn endgame.... there is no draw option (or 40 move rule or anything to recognize a draw). The program will keep playing until you get tired. It won't let you quit unless you concede the game! Pretty cheesy. Certainly, the presentation and theme is nice. Stats are kept on how you're doing against each personality. Again, in a toy of this type, you shouldn't look for serious features, and you won't find any. There are multiple types of boards and pieces available, but not in the shareware version. The shareware display is actually pretty bad. The board is nice enough, a slate and white faux marble, but the pieces are just flat black and red (what did you expect) with a lightning bolt emblazoned on them. You play on the white squares, which is actually a good thing as there would not otherwise be enough contrast with the black pieces. Music and sound are also a part of the package. Registration at $19.95 plus shipping seems more than a bit on the steep side, especially for a program that is best avoided even in the free shareware version. I thought this program was worth two screen shots: this one showing how you choose an opponent personality, and this one of the board display. Overall: Not worth your time or money. This is an entertaining little item. There was once a Cafe internet site for playing games on-line, but it is no longer in service. 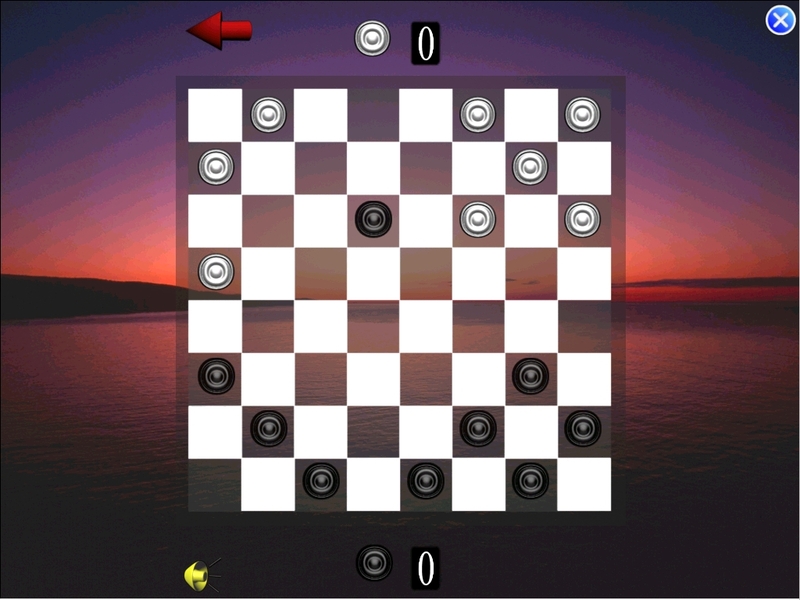 Instead, they offer, for free, these little game playing applets for Windows, checkers being one of several. It's a quick download and a nice little program with a simple but adequate display and drag and drop interface. No frills, no skills. Wait--- did I say no skills? The program claims to be a strong opponent on the highest level (there are 9 levels of, uh, expertise). On level 9, lowly little me plays about an even game if I put myself on autopilot and just sort of click around. If I think for more than zero seconds per move, I win easily. In other words, this one isn't so good. It's a bit stronger than some of the other losers reviewed in this category, but not even as good as the Zillions of Games offering. No features, but then nothing is claimed in this regard. Overall: Will hold your attention for up to five minutes over the course of your lifetime. I did get this nice little screen shot. I am not sure whom to credit this to; the download said Epic Megagames but everything in the game says Twisted Pine. Maybe Twisted Pine developed this for Epic? Anyhow, are three levels of play. I started out at the highest, which is called 'genius' level. and won without even trying. Here's another program that seems to search about one level deep, and has trouble figuring out whether or not it's playing giveaway checkers. There is sound and music, and incredibly slow and annoying animations which can fortunately be turned off. Save and restore game is an available feature, as is multiple level move undo and redo, which would allow you, if you are of a sadistic nature, to review the whole history of you slaughtering the poor genius-level computer. The board looks nice enough; at least it's not red and black! There is an alternative board display as well, which looks like something out of a hallucinatory experience. To what use could this implementation be put? Well, none that I can think of; there are better games for kids, even, than this one. Fortunately, the game is now abandonware and thus takes some effort to find, sparing you this experience. I don't give a link for it; if you really want it, you'll be able to dig it up on the internet. This is another game worth two screen shots; one of the regular board and one of the psychedelic board. Overall: If you can't locate a copy, that's good. There is a checkers game as part of a group of games, perhaps a dozen in all, aimed at kids of some indeterminate age. The checkers game is about what I expected, abominable. The play is terrible, but the engine tries to make up for it by cheating and not taking some jumps! When you want a multi-jump, there is a 'more jumps' button to click; you are asked this question after every jump, whether or not multi-jumps are available. By the way, did you know that White moves first? Against Simple Checkers, this program seems to move at random until the game is over, and, of course, lost. This is a checkers game with a Braveheart theme, for reasons known only to the author. There is a full 3D environment; the checkerboard is on the floor of a large room, and there are controls for zooming, panning, rotating, etc..... all the stuff you've come to expect in a video game. There are Braveheart related objects, drawings, etc, on the walls of the room, and the checker pieces have emblems which I guess also relate to Braveheart. But don't get too enthusiastic and rush out and download this item. First, the 3D scrolling on my 2Ghz Pentium with high-end video card was unbelievably slow, choppy, and erratic, to the point of near unusability. When I finally got a view that didn't have either (a) parts of the checkerboard offscreen, or (b) a perspective or angle that made rational play impossible, I then had to put up with a horrible piece motion system. 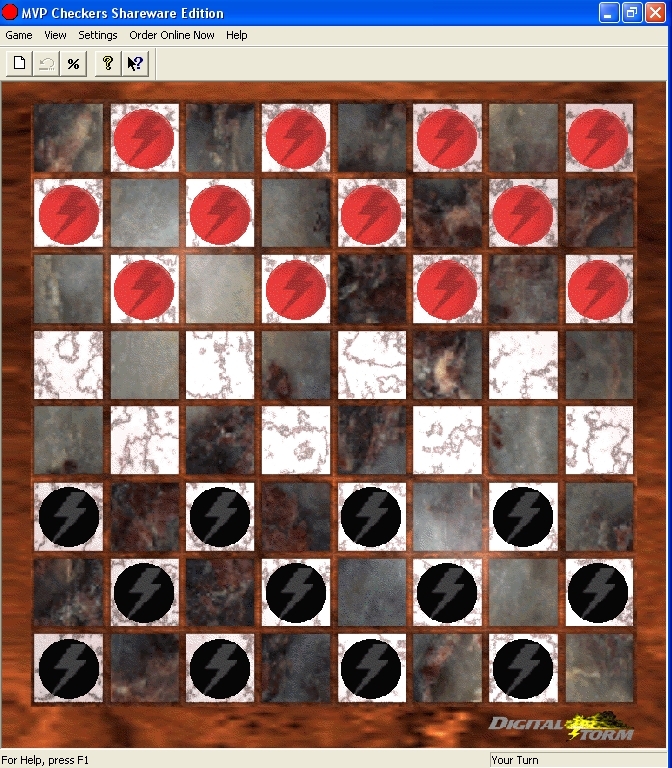 The animation (or lack of, really) was so fast that pieces changed position faster than an eyeblink, leaving me wondering what move I made, let alone the computer opponent. And it gets worse, very much worse, in fact. The program is free (you get a free registration code from the author's web site), but when you install it, one of the most intrusive and stupid pieces of spyware ever invented installs right along with the game. You have no choice but to install eZula Hot Text, a piece of hijacking software that takes over your web browser, annotating the pages with links and suggestions for things to buy. Do not install this game unless you have a copy of Spybot Search and Destroy ready to run. But you can't have it both ways. If you run Search and Destroy to get rid of eZula, the next time you run the game your screen locks up solid. I ran Spybot, disabling the game, and I refuse to re-install this thing to try to get a better determination. Learn from my experience and avoid contaminating your hard drive with this miserable product. Overall: An abomination of Biblical proportions. Good grief. The first thing you notice is that your double corner is on the left. And the board appears in a twisted perspective that makes visualization and play rather difficult, as if the mirror imaging weren't enough of a problem already. The whole purpose of this offering seems to be to overlay some sort of medieval theme; actually playing checkers is clearly secondary. At the highest level of difficulty, it can sort of play, at least up to a point (meaning that it doesn't throw away pieces too often). The lower levels of "difficulty" are laughable. This, folks, is the program mentioned above, under Simple Checkers, which will get a king and then endlessly shuttle it back and forth between the seventh and eighth ranks, which is pretty rank. There are no features; there is a tournament mode that I can't figure out; there is a choice of three 'locations' which are just different background pictures.... except for Dragon's Lair, in which the dragon will roar and the whole picture will shake periodically. Atmosphere, I guess, but it doesn't seem to have a lot to do with checkers. This is a $10 shareware program and it should be avoided. Even if you think it might entertain children, it will teach them a goofed-up version of checkers, so don't ruin their development by letting them near this game. This is a relatively new entry into the market. It features fuzzy 3D boards, a variety of opponents, and a setup in which white moves first--- and you always play white. I only played the demo, which allows only the first two of several 'skill' levels. The authors say that you can play against harder opponents as your skill level increases. Well, it won't have to increase much, because this program plays the worst game of checkers I've seen in a long time. I'm not going to order the full version ($10 plus shipping) to see if there is any improvement at higher levels, as I really don't expect much. Stay away from this one. It even suffers from fuzzy graphics. Oh, there is an option to make jumping non-mandatory. I'm not surprised. The implementation of this is so bad that it doesn't understand double (or multiple) jumps, and there is a little box you have to click when you have a multiple jump to make (which apparently the game thinks is optional). The shareware version only allows for plays between two human players! On the shareware exit screen, we are told 'Now that you see how beautifully it plays, order the full version and be able to play the computer' or similar words. They've got to be kidding. All you've seen is a few animations and a thoroughly average play interface, but trust them, the full version plays a strong game. It's fortunate that the company, Software Creations,is no longer in business (as far as I can tell) so you can't throw your money away on this one. Well, maybe you wouldn't be throwing your money away. But you have no way at all of knowing. I'm trying to obtain the full version through the used market, and I'll report further if I do. If you can help me with this, please write bnewell@bobnewell.net . You can only play white; white moves first; and the double corner is on the wrong side. Best stay away from this one. 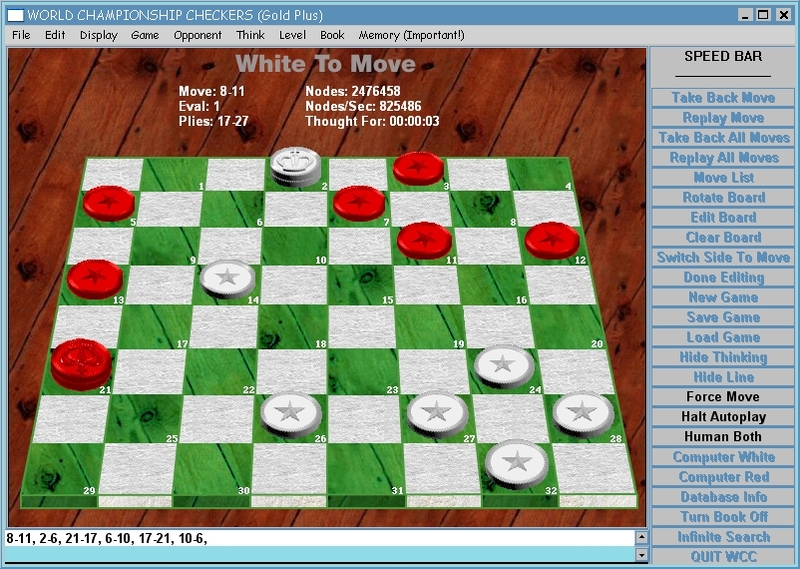 This is a freeware collection of several games, including checkers, with a selection of move search methods and playing strength. White always moves first and you can only play white. There is a serious bug which the author recognizes: 'Checkers does not allow selection of multi-move jumps.' So, if you have a choice of multi-move jumps, you don't get to pick which one you play. Sorry! 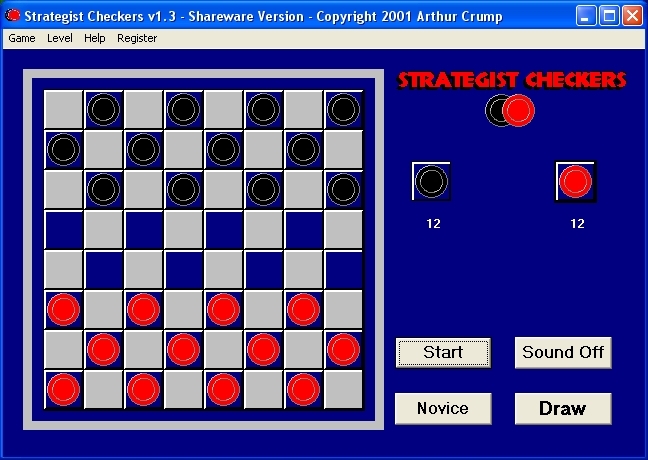 Playing on the 'supercomputer' setting with the alpha-beta search, Strategic Games Checkers loses quickly to Simple Checkers. This one is another proof of concept, but doesn't have the playing strength of Martin Fierz's Simple Checkers, and lacks much of a set of evaluation rules. So it really doesn't serve any purpose that I can see. Martin Fierz's program would be a much better starting point for anyone looking for a playing algorithm or a place to start. Another flashy program that can't play checkers. Honestly, there is more of this kind of stuff out there than I can keep up with. Fortunately, none of us need waste our time on these. I've now put all the Palm reviews in one place. That makes sense for a couple of reasons; one is for ease of location, and the other is because they're all bad anyways and group together nicely for that reason. It is sad, but there is just one Palm program that can even come close to Simple Checkers in playing strength, and that is a less-than-wonderful port to the Palm of Simple Checkers itself! Some are worse than others, but only that one is even in the Class D category, despite some wild claims by the authors and vendors. Lest you think that good checkers can't be put on the Palm platform, consider that the very same Palm supports the Hiarcs chess program, which plays at nearly 2700 ELO strength, well into the grandmaster category. There is no excuse for Palm programs to play checkers at no better than the 1000-1200 level. 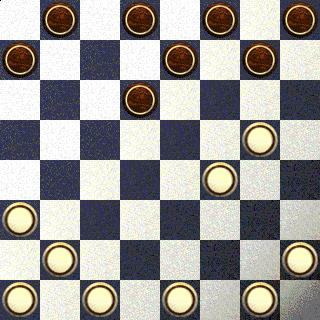 I might try re-porting Simple Checkers to the Palm, to see if I can make it come out better than the existing port. Martin Fierz has mentioned the possibility of a limited-memory port of Cake Manchester; now that would be something! And now, on with the bad news. This one has a nice interface with a choice of 2-D or a 3-D board, a selection of playing 'strengths' and a game review feature. All in all it's nicely done, and it's a pity that it's such a poor player. And, at the 'highest' level of play, it is incredibly slow even on my 400 MHz Tungsten C.
In fact, it's stronger than some other Palm programs, which is a sad tale. Some others play so badly they are even more of a waste of time. Cascata does a little better, but in my standard playoff against Simple Checkers, Cascata goes down easily. Is this program worth the $13 that Cascata asks? Only if you absolutely must have checkers on your Palm. A screen shot is here. Not bad! Overall: A poor player and intolerably slow at the highest level. This is a port, apparently unauthorized, of Martin Fierz' Simple Checkers engine, which as you've seen is used throughout in testing candidate programs against a medium-strength engine. The port is extremely plain, with no graphical appeal and no features at all, not even saved games or move review. 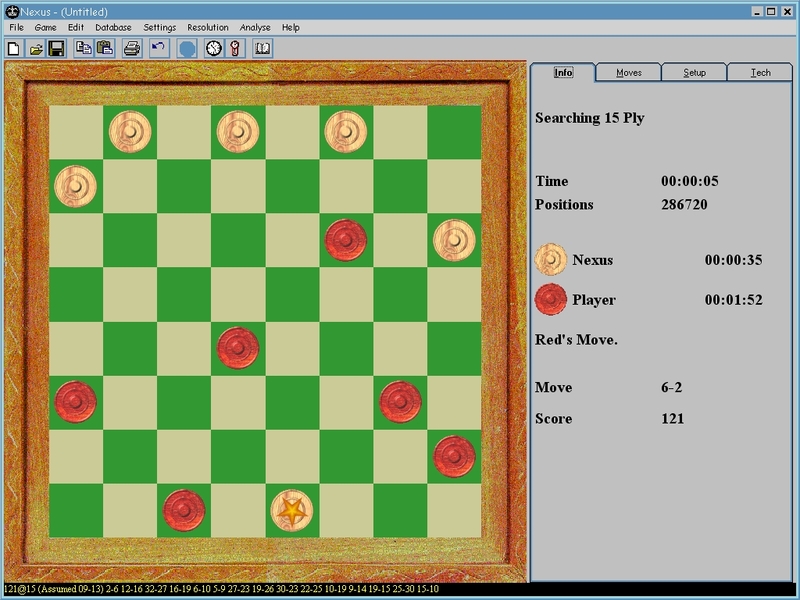 There are nine levels of playing strength, as in the standard source code version of Simple Checkers. At level 9, the program uses about 15 seconds per move on my Tungsten C, which I consider reasonable. I played this against PC Simple Checkers. I gave PC two seconds per move and I set Palm to level 9. I expected an evenly played draw (as I always get when I test PC in autoplay mode). This, in fact, did not happen. While the game was certainly a good one, PC did have the better of it, eventually winning a piece but then not untypically finding itself unable to win a 3 kings vs. 2 kings endgame; a draw via move repetition was the final result. Still, this puts Palm in the Class D category; playing respectably against PC but still having the worse of it. Why wasn't it pretty even? I tried to compensate for the 2 GHz speed of PC, vs. the 400 Mhz speed of Palm, by limiting PC to 2 seconds per move and allowing Palm to take its time, as mentioned usually about 15 seconds. Palm had plenty of free memory (almost 40Mb) so for a program of this size, with no databases, that should not be an issue. Perhaps I didn't get the timing factor right? Perhaps the implementation on the Palm caused a drop in playing strength? I don't have the answer as yet but plan to experiment further. This is at the moment the best offering for the Palm of which I'm aware. But there is oh-so-much room for improvement. Overall: Sort of adequate, but disappointing; could have been much better done, and the author should have gotten an OK from Martin before putting this up for sale on a profit-making basis. I thought I had finally found the right game for the Palm. 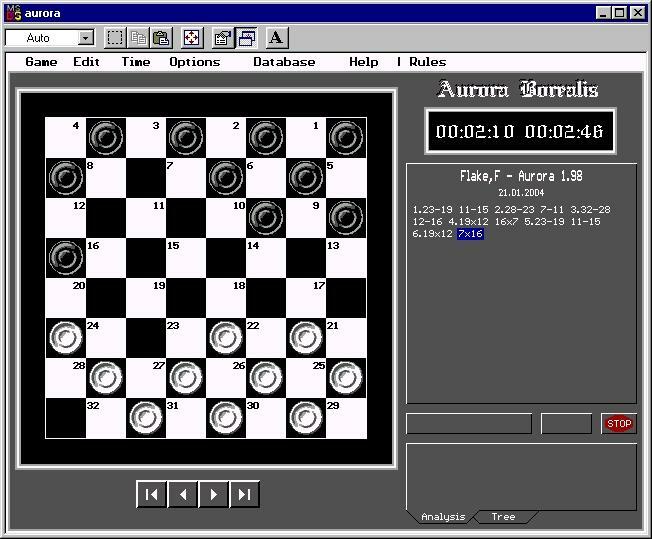 Six levels of play, many varieties, save and restore features: alas, this one too is destroyed by Simple Checkers, even at the highest level of play, laughingly characterized as 'an incredibly strong computer opponent.' I spent $13 on this; you don't need to follow suit unless you want variety without playing strength. There is little to tell between the six levels of play; they are all terrible, with the best level only a little better than the worst. At the lowest level it plays almost instantly; at the highest level, it still plays very fast (and that could be a problem). The major feature of this program is its ability to play numerous varieties, such as international, Russian, Pool, Canadian, and others. It plays them all badly, I imagine. There is at least a move review and save game feature (but you can only save three games). The display is really strange, with the black and red squares that some people think are a checkerboard, and black and gray pieces, making legibility poor. Take a look here. This is another one that plays several varieties (such as Russian) but not nearly as many as Checkers Plus. There are four levels of play, and the strongest level is quite a bit better than the weakest level.... but the strongest level is quite weak, if you follow my meaning. I spent $12 for this and wanted to cry as I watched Simple Checkers take it apart without even breathing hard. There are a couple of features: move review, save to database and load from database. The display is orange and light purple squares with blue and red pieces. I am serious. Just look at this screenshot! This is a combination package, incorporating chess, backgammon, and checkers. There are no features other than single-level undo; no save/load game, complete move review, etc. Nothing. The display is nice enough, with charcoal and white squares and white and maroon pieces with a slight but attractive 3-D effect. This screenshot is quite nice. Too bad it can't play; too bad I can't rate it lower than F. The program is a great match for a five-year old who learned to play yesterday evening, but give that kid a couple of days and it's all over for ChromaGames. This is clearly one of the worst in a bad crowd. And they want $20 for it. Geez. A few weeks ago, I was in Circuit City and saw a hand held checker game called "LCD Chess & Checkers" by Excalibur Electronics for $11.99 (normally $14.99, lists for $24.95). I was a bit skeptical having been burned once before by the absolutely terrible Pocket Checkers from Radica which is now in the hands of my 5 year old after my 10 year old said he was bored with it because he could beat it every time (see Jim Loy's review). I'd seen an Excalibur chess & checker game called KingMaster III at Toys-R-Us some years ago, so in hopes that this would not be a "first attempt" by the company, I bought the hand held game. I've toyed around with it a little and here's my review of the checkers side of the "Chess & Checkers" game. 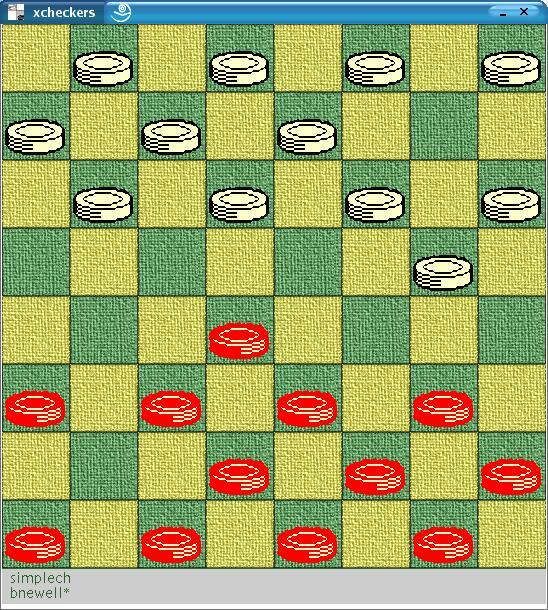 First of all, the board on the screen is noticeably larger (1 5/8 inch) than Pocket Checkers (1 1/8 inch), but the white pieces are a bit hard to see. Pieces are actually chess pawns, which isn't so bad, it's just that the lines that they are drawn with are so thin it makes the the white pieces hard to see. There's a contrast control which helps. The Excalibur unit has quite a few nice features. It has a Setup Mode in which you can set up positions to play or let the computer solve. It has 16 difficulty levels: 1 ply, 2 ply, 2 sec, 3 sec, 4, 5, 7, 8, 15, 20, 25, 30, 40, 50, 60 sec, and infinite. All times are exact. It plays much better than Pocket Checkers, but if you're looking for master level playing machine, this is not it. There does not appear to be an endgame database as it has trouble finishing off wins. I set up a 3 Kings vs 2 Kings (B:WK27,K9:BK19,K15,K10.) and it could not find the win on level 15 (60 sec). What I have found is that at the higher levels, its play is not terrible (ie: it sometimes beats me, a very rank amateur) until the endgame at which point it seems to flounder. If I'm down 3 to 2, I just call it a loss and start a new game. One annoying thing is that even though there are 3 different sound settings, none of them turn the sound completely off. At the minimum sound settings, it still beeps quite loudly if you accidentally press an invalid key, which is easily done. I bought it with the idea of playing with it on a long flight from the States to Nairobi that I was about to take, but I didn't use it on the plane as I thought the noise might disturb fellow passengers. The button interface is a bit awkward. Radica's Pocket Checkers has a simpler, easier to use button interface in which you use one set of arrow keys to select a piece and another set to indicate the move direction. This one, however, uses the same set of keys for both. You use the arrows to select a piece, press a button, then use the same arrows to indicate the direction of the move. It might make more sense for chess, but not so much for checkers. There is sort of a bug (feature?) in the software. Sometimes, it doesn't allow you to select a particular piece to move using just the arrow keys like normal. When this happens, there's an alternate button for selecting pieces which gets around the problem. I'd say it's not a great checker playing machine, but it's not so horrible either. To be fair, it's really a chess machine which also plays checkers. (It has a lot more options for chess.) That's probably the only way they could realistically market a checkers playing machine. It's a great toy for someone like myself, but I'm not sure that checker experts would enjoy it. You might consider giving it as a gift, especially for a gameboy influenced youngster who believes a game in the hand is worth two on the table. If you want to take a look at it, use this link. 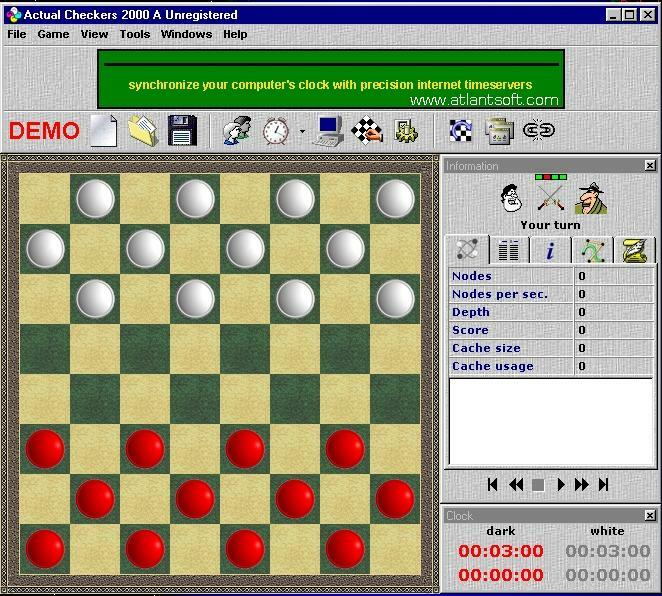 In keeping with the practice of comparing programs with Simple Checkers that comes with Checkerboard, I played a game with LCD Chess & Checkers (at the 60 seconds setting) against Simple Checkers (set at 1 second on a 2.4GHz Pentium 4). The result was that Simple Checkers clearly had a win but was not able to finish it off. This is a new review category (as of January 2012). Here are some reviews of iPhone checker apps by esteemed checker programmer Ed Gilbert. Android app reviews will follow at a later date. If you want a program that plays a world class game, is full of useful features, and is inexpensive (free, in fact) use the Cake Manchester or KingsRow engine with CheckerBoard. The display is not exactly fancy but that shouldn't be the deciding factor. You will have both the worthiest of opponents, a fine analysis engine, and an unmatched set of features. If you want a program that plays an excellent game, has numerous useful features, and (at least apparently) reflects published play in the openings, choose Sage. The cost is very moderate ($19), the display is nice (even though you can't get the colors quite right), and the play is top flight even if short of the very strongest programs.... and you do have the option of dropping in stronger engines and the large endgame databases. In the low-cost category, Nexus is an alternative to Sage, for just a few dollars more. There are tradeoffs between the two, making a clear choice difficult, but Sage is still developed and supported while Nexus is not. I am told that if you want to go all the way to the top and cost is no object, Nemesis is the choice. I cannot verify this, as I did not review Nemesis here because I don't as yet have it. In addition to being at the top of the quality list, at $119 it is at the top of the price list as well. That said, I am planning a purchase when the next release is out; I will report further here. If you are a Linux user, don't overlook Simple Checkers with the XCheckers interface. It will give you a satisfactory game every time, even if quite shy of master level. And now, with Cake++ available, you can get an excellent game on the Linux platform. But if you want something free that has merit for young kids, dive down into Class F and take a look at Magic Wand Checkers. You can start the kids off at the very easy level and ratchet up as they improve their game. They will always be charmed, but never totally frustrated. Some day, of course, they'll be ready for better competition. Or, if you are even less interested in playing strength, but want something with a more flashy look, you could always spend a whole $1 on Classic Checkers. I am not an authority on what motivates small children but the important thing is to get them playing checkers! 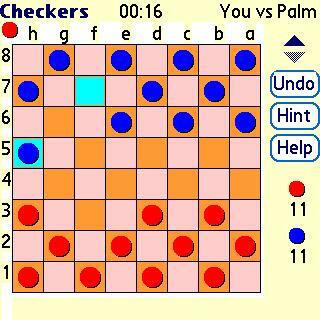 If you want a Palm program, consider CheckersKing, an uninspired Palm port of Simple Checkers. It plays a fair game, and no more than that. There is nothing else currently available truly worth your time or money, and at least this one is only $5. 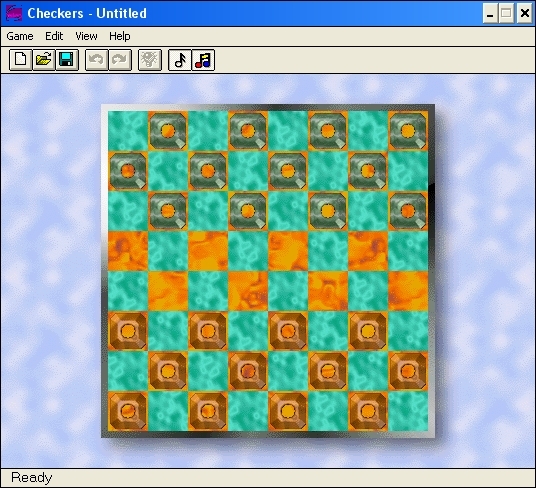 You could also look at Checkers Plus; it can't play checkers worth a hoot, but it does have a lot of variety. There are really three types of checker-playing programs out there: the really serious, the pretentious, and the trivial. The really serious programs, perhaps ten or so in number, cater to serious checker players. That is an unfortunately small audience in today's world, yet the serious programs represent a lot of time and effort and a very high level of achievement. This achievement has reached a level such that Martin Fierz, one of the world's preeminent checker program developers, feels that checker programming is now a matter of having the best opening and endgame databases; the tactical engines are at an incredibly high level with little to choose among the very best of them. But then there are the programs that claim to be serious about checkers, but the authors didn't put in the effort to produce a product with anything like top-flight playing strength. This is common in the world of shareware, where sometimes egos overcome judgment, and outlandish claims get made by programmers who, overly proud of their products, thinks they are the greatest things ever. They could have at least surveyed the market. Just look above and you see that nearly all of these programs can't defeat--- or even get thrashed by--- Simple Checkers. A friendly word of advice to would-be checker program authors: study Simple Checkers and use its methods, if need be. If you cannot turn out a program that plays at least as well as Simple Checkers, you are wasting everyone's time, especially your own. The third category, the trivial, ought to annoy and offend every serious checker player, at whatever level of skill. These are the products that, in their trivial implementations, in turn trivialize the Grand Old Game, and perpetuate the public concept that checkers is 'easy' and just 'a kid's game.' Some of these products, to be sure, have flashy graphics, music, outlandish themes, and all sorts of trappings intended to 'dress up' a game that in fact stands on its own quite nicely, thank you. I don't need a game with roaring dragons to get my interest --- the authors of which don't even know how the board is supposed to be oriented. Those of us who hope that someday there might be a revival of checkers as a widespread, seriously played game, can only shake their heads, realizing that such trivial and trivializing products hurt the cause a great deal. What is needed, although this is wishful thinking to be sure, is a product that is as serious-minded as Nemesis, with serious features as in CheckerBoard, with a fine presentation such as Wincheck, and with the widespread distribution of a product such as the Chessmaster series. Now that would move us in the right direction! Yes, I know, I'm dreaming. But please allow me. Please send comments, suggestions, corrections, and protests to bobnewell@bobnewell.net. Bob Newell, Santa Fe, New Mexico; last modified 06/06/12. Site optimized for viewing with the open-source Firefox browser.